DAY6 releases the track list for their upcoming album “Shoot Me: Youth Part 1” and takes one step closer to their 2018 comeback! After announcing their plans for a comeback on June 11, the band released the track list and announced their title song on June 13. 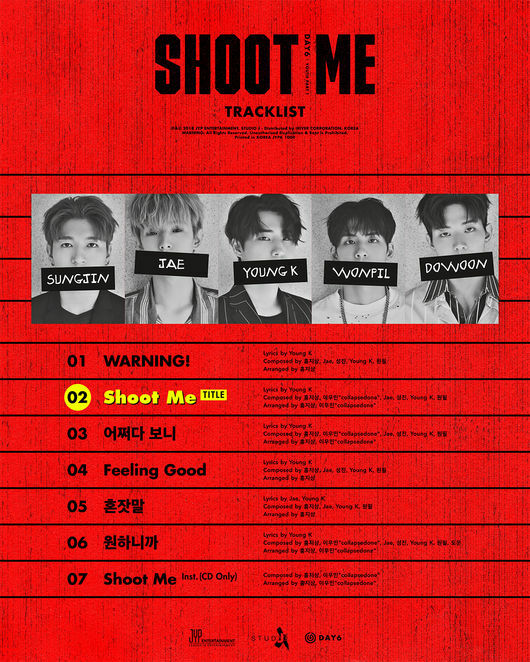 According to the track list, the title song is “Shoot Me,” for which DAY6 member Young K wrote the lyrics. On June 13 at 12 AM, KST, JYP Entertainment released an image containing the track list for DAY6’s 3rd mini album ‘Shoot Me: Youth Part 1’ scheduled to release on June 26. According to the image, the track list includes 7 songs in total, with “Shoot Me” as their title song. In addition, the track list revealed that all 5 members of DAY6 participated in either composition or lyrics of the tracks. Young K, especially wrote the lyrics to all 6 songs (last one is instrumental track), thus wanting to share his thoughts and minds with his fans. Besides ‘Shoot Me,’ the list includes ‘Warning,’ ‘Feeling Good,’ and 3 other songs. Meanwhile, DAY6 established their position in the field with high-quality self-produced songs after their debut in 2015. In 2017, the band released 2 full albums and over 25 songs, and performed in total of 25 stages. Furthermore, they plan to hold their first world tour ‘DAY6 1ST WORLD TOUR ‘Youth'” in June. Throughout the tour, they are visiting over 15 cities starting in June, continuing onto Europe next January. DAY6’s 3rd mini album ‘Shoot Me: Youth Part 1’ and its title song ‘Shoot Me’ will become available on June 26 at 6 PM, KST.